Yes, I know this is a Christmas song. I. Don't. Care. I will see Marie Miller at the Behold Conference tomorrow, and this is my favorite song by her. It was fun to see this video on tv this Christmas season and think that I "knew" her before she was big. I mean, I saw her at the Behold Conferences in 2011 and 2012- we are practically BFFs. I love her voice and her style and the instrumentals in her music. She is seriously talented! I'm sorry that I missed out on 7 Quick Takes last week. My Thursday night writing slot was sadly interrupted by a visit to the ER. You can blame that family member (hi mom!) and my 3 a.m. bedtime and 6 a.m. wake up call for not having seven random stories to brighten up your day. My mom is probably the only one who was sad that I didn't post, so it all works out. Don't worry, she is fine, and who doesn't love a good hospital visit when you are out of town, right? Yay for the ER! Speaking of family, I have plugged my sister Stephanie's photography business a couple of times this month, so today I will plug my sister Emily's blog. She is back after a too-long hiatus with three (three!) posts so far this week, all of which are eloquent and funny and making me miss her. I loved this post that she wrote to answer the question, "What do you do all day?" 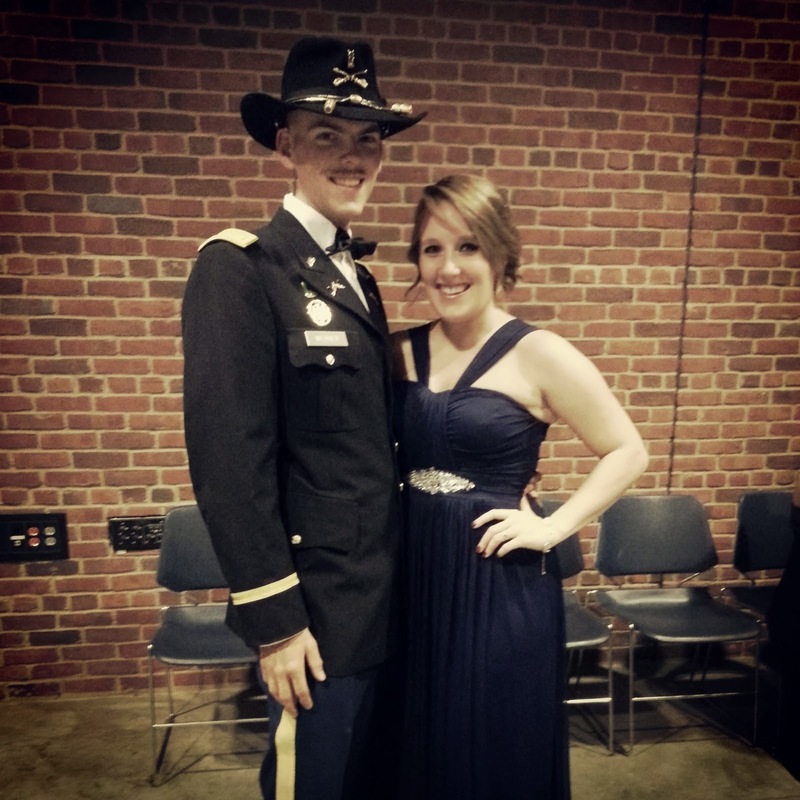 in her role as a mostly-stay-at-home army wife. Go visit her, and tell her I sent you. Mo-vember was maybe a bad month for my brother-in-law. Mo more mustaches, Luke. On another (non-ER related) late night, I was having a hard time falling asleep even though I should have been in bed for hours. I am a night owl through and through. I was setting one of my three alarms for the morning (yes, I set three alarms. Not three separate times on my phone. I set multiple times on my phone. On my ipod. And on a normal alarm clock. Because mornings are heinous.) when I was inspired to get a little creative. While scrolling through a particular playlist and choosing songs that had great opening bars that might get me moving, I decided to coordinate the song, the time of morning, and a name for the alarm. This is my sense of humor at about 2 in the morning. 5:14 a.m. The time I usually go back to sleep. The time at which I have to get up to make it to daily Mass. Title: "Makin' it to Mass! All the people say Amen!" Song that plays: All the People Say Amen by Matt Maher. 5:50 a.m. The time that I have to get up to look like a put together human, eat breakfast, have a little prayer time, and start a productive day. Title: "Time to do great things." Song that plays: Great Things by Matt Maher. Title: "Blessed is the one who is well groomed." 6:30 a.m. The time that I have been getting up more often than not lately. Title: "Jesus rose from the dead, you can rise from this bed." 6:42 a.m. The last call. Title: "Only a miracle will get you there in time." I would really like to say that this creative technique has helped me to get up on time more often this week. I had a personal-I'm-not-grading-papers-protest for about an hour one night this week. I desperately needed to uncover my desk from stacks and stacks of papers. I blame my students who decided that turning in homework was optional last week (or the whole month of February) and gave me everything on Monday. Ugh. So instead of digging out my desk, I productively procrastinated. Are you familiar with the term? a task or series of tasks by which Katie delays necessary work which may or may not be time sensitive by occupying her hands and mind with an epic undertaking that will change life as we know it. Or better known as Katie makes a craft. Productive procrastination this week yielded me a new door decoration. I have been meaning to decorate my "unused" second door for approximately 16 out of the 16 months that I have been teaching in this classroom. It was critical to complete this week. I do like how it turned out though. All bright and cheery with an inspiring quote that goes along with our classroom curriculum and works the Pope in to boot. Plus, he is just so cute with his little friendly wave, don't you think? One of my students told me that I looked like a pistachio this week. I am not quite sure what to make of that. 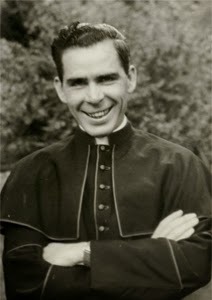 Are you praying the Fulton Sheen Novena for his canonization? If not, you should be! Also, if you are looking for a Lenten resolution that will add something to make you grow closer to God (instead of just taking something away), may I suggest reading Sheen's Life of Christ, with a goal of finishing it during Holy Week? I did just that during last Lent somewhat accidentally, and it was so influential that I plan to start rereading it next Wednesday. Watch for a post about that soon-mostly because Nancy at Reading Catholic is hosting a series and asked me to contribute. Thanks, Nancy! It had something to do with the fact I had on brown and green. It is still weird. 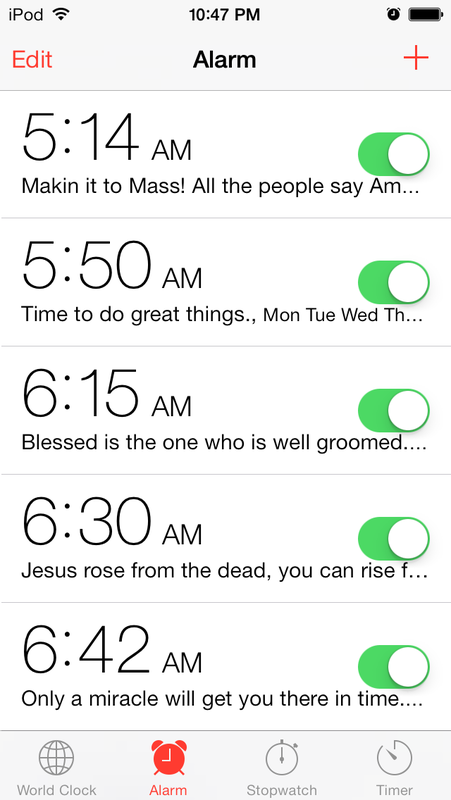 I love your alarms. Especially the last two. Miss you! Set an alarm to see me! Haha, Bonnie, you made me laugh out loud! I'm using this in my arsenal for when Luke feels the need to grow facial hair again, of any sort. You are a Treasure in Clay!